When the Ducks landed Taj Griffin, the fourth-ranked RB in this year’s class, my initial reaction was joy. Afterwards, though, I got to thinking. Royce Freeman is a way-too-early candidate for Pac-12 player of the year, Thomas Tyner returns healthier than ever and Byron Marshall is still the most dynamic player the Ducks can hand the ball to. In short, there are a lot of guys who deserve carries, but there simply won’t be enough carries to make everyone happy. In the past, the Ducks have featured two premiere backs. The recent running back duo of LaMichael James and Kenjon Barner is a prime example of this situation. 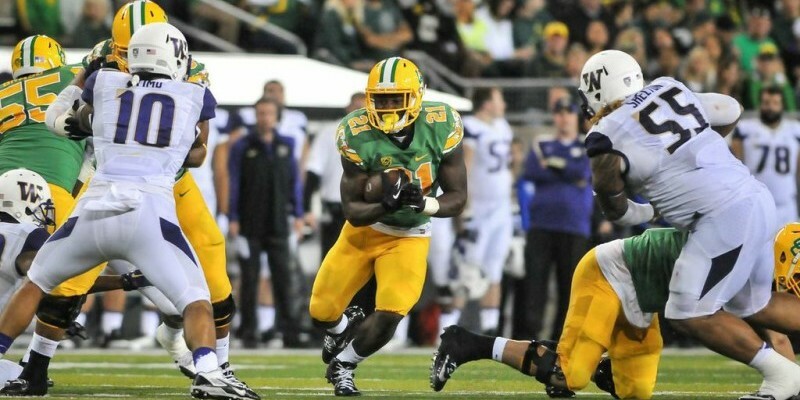 In 2011 the Ducks were stacked at the RB position, as they so often are, yet Barner (152 carries) and James (247) both still managed to rush for more than 900 yards each. Another guy you might’ve heard of, De’Anthony Thomas, finished third on the team with 55 carries and almost 600 yards rushing. Those numbers, although historic for some programs, have come to be expected from the Ducks. Although Tyner is older, Freeman seems to be the more promising back for Oregon. Jump forward to 2015 now, and the Ducks are in a similar situation. Except, and this is a big asterisk here, there are way more than two backs who feel like they’re going to deserve a bulk of the carries. Although Oregon is a team dedicated to “Winning the Day” and making sure to place the team before individuals, there’s no escaping the fact that talented players are going to want game time. On top of the aforementioned players, RBs Tony James and Kani Benoit both should expect at least a slight increase in carries, too. In the words of the late Billy Mays, though, “But wait, there’s more!” Oregon QBs are required to run an effective read-option offense, and without the ability to tuck and run, Oregon QBs wouldn’t see the success they so often do. Although we as fans applaud Oregon for this fact, to the coaches it’s just more carries that have to be shared. Although Freeman is the for sure No. 1 RB next year, and will see a share of carries to verify this, what the Ducks do next is up in the air. Could the term “Running Back by committee” take on a whole new life? Perhaps. The one thing that is certain though, no matter who’s running the ball, is that the Ducks will see success next season on the ground.